Some unusual birds showed up in the Nicola Valley area in late November and December 2012. 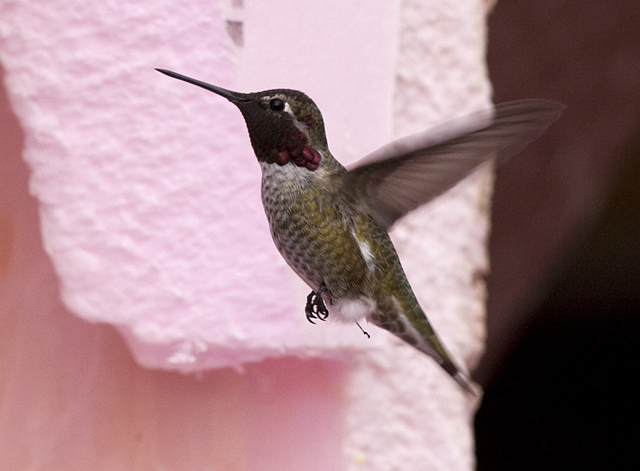 2013 Update – our rare hummer has disappeared The Anna’s Hummingbird described below survived for many weeks at a heated feeder in Merritt and was even included in the Merritt Christmas Bird Count on 16 December 2012. Alas, the very cold weather at the end of December seems to have been too much for this little guy despite the care taken to keep it alive. It was last seen on 31 December 2012. That night the temperature dipped to -20 C which appears to have been too much for this bird to tolerate. 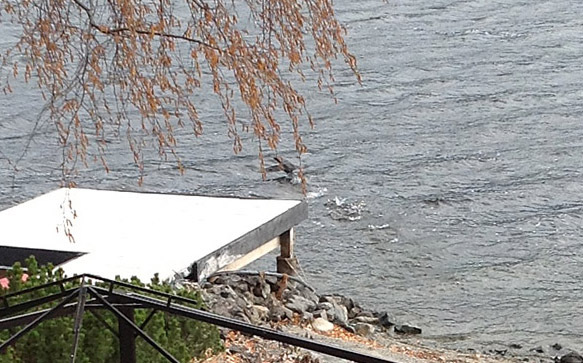 Although occasionally seen in lakes in the Okanagan and Kamloops area, the Double-crested Cormorant is not often found on Nicola Lake. One was seen there several times in late November and Liis Jeffries managed to get this fleeting photo near the west end of Nicola Lake. An immature Double-crested Cormorant, almost certainly the same bird, was also seen at the western end of Nicola Lake on 14 and 16 December 2012 (the latter date was the Merritt Christmas Bird Count). A male Common Grackle has been frequenting feeders in the northern Bench area of Merritt. It is usually seen in with the flock of Eurasian Collared Doves which hangs around the Bench Park, Parker Ave., Gillis Rd area. Eurasian Collared Doves were themselves a rarity five years ago but are now very common in Merritt, as they are in many other towns in southern BC. The grackle seems quite shy and has not often been seen. 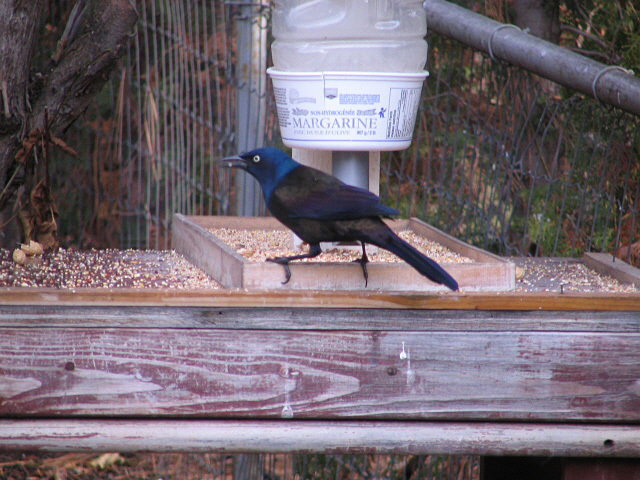 Common Grackle at a feeder in Merritt. Photo: © Sue Kerr. This species was once a very rare sighting in British Columbia but over the past 30 years has become increasingly common year-round in the milder coastal areas of BC. Over 1000 birds now overwinter in Victoria and increasing numbers in the Lower Mainland. But to find this species at the onset of winter in Merritt is a big surprise. This male originally turned up at feeders in Spanish Creek Place and nearby Coldwater Road in October and is still going strong in early December. These were some of the first photos taken of this bird and the purplish tinge to the forehead and wide dark throat gorget let some to think this might be an even rarer Costa’s Hummingbird (usually found in Arizona, Mexico and such areas but known as a vagrant in BC). 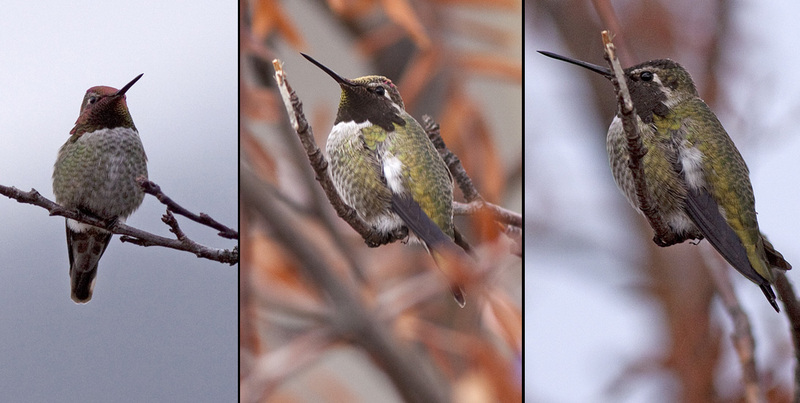 The first photos of the Anna’s Hummingbird in Merritt, 1 December 2012. Photos: © Laura Grosjean. But through the BC Interior Bird List group the identification was confirmed as Anna’s and not Costa’s. Sheri Williamson, of Arizona, who wrote the book on Hummingbirds of North America (Petersons) concluded: “Definitely not a Costa’s – the tail is much too long, the bill is too straight and robust, the upper breast is dingy and mottled rather than white, the belly lacks a pale midline, etc.” Some of these features can be seen in these more recent telephoto pics. Can this tiny bird survive the Merritt winter? The keepers of the feeder where it is feeding on Spanish Creek Place have set up a sheltered feeder, kept warm with Christmas lights. They are aware of the need to provide some protein source in addition to sugar water and are getting information from various web sources on what to provide. Lets hope the little guy makes it through the winter. This entry was posted in Features, Photos, Uncategorized. Bookmark the permalink.